The Maruzen Group owns forty-five and seventeen tanks of varying capacity in an organic hazardous materials yard and inorganic non-hazardous materials yard, respectively. Since all tanks constitute all-stainless steel tanks, we can store a wide range of chemical substances, including a diverse range of organic chemicals, fine chemicals, petrochemicals, and other raw materials. We also possess tanks equipped with peripheral systems for moisture retention, humidification, cooling, deodorization, nitrogen encapsulation, and other purposes. By harnessing the technical capabilities we have retained as a former boiler manufacturer, we can also flexibly facilitate the installation of special peripheral systems as requested by clients. 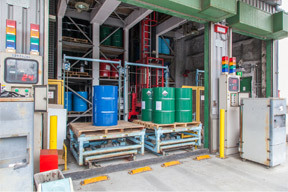 A warehouse for hazardous materials and warehouses for ordinary materials are used to store all sorts of chemicals in warehouses. By automating and enhancing the mobility of systems, we can seek to make qualitative improvements in terms of storage, loading and unloading functions, distribution processes, and logistics. Linked to our host system, this is our automated multi-tier warehouse for hazardous materials. It can house class 4 hazardous materials (inflammable liquids), class 2 hazardous materials (inflammable solids), and designated combustibles. The equivalent of 10,000 drums can be stored at this location. 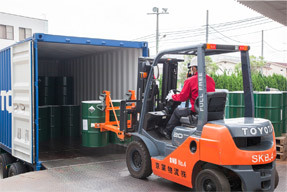 These warehouses are used for the storage of non-hazardous chemicals and poisonous materials. 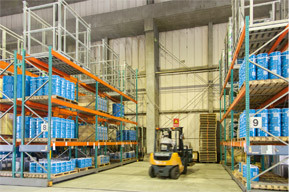 An automatic rack-equipped warehouse for ordinary materials houses approximately 3,600 drums. This location can also be used as a worksite for the disposition of goods in times of rainy weather. Our proprietary inventory-management system makes it possible to store and retrieve goods and materials in a speedy fashion. We can also accommodate the diversification of items in such terms as containers and modes of packing when they are entrusted to us by our clients. 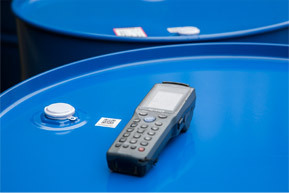 We are also working hard to prevent mistaken shipments from occurring by thoroughly carrying out work procedures according to a quality assurance management system based on ISO 9001 and by implementing an inventory management system designed to enable accurate lot management and manufacturing of a wide variety of products in small quantities. We load and unload dry containers used for importing and exporting purposes. Since all warehouses owned by the Maruzen Group are bonded, they can be used to store foreign cargo arriving by overland transport (OLT). Customs clearance procedures can also be carried out at these warehouses to allow materials to be exported as foreign cargo. By undertaking all work from warehousing to shipping, including the loading and unloading of trucks, in an integrated manner, the Maruzen Group endeavors to streamline the work carried out by clients and promote cost savings.